Mark Savernake’s novels have garnered rave reviews and a cult following throughout Europe. His stories have appeared in more than 60 magazines and journals internationally, including the renowned Ellery Queen’s Mystery Magazine. In 2005, he won the Frank O’Connor Award from Descant magazine for his short fiction. He was cited in Best American Mystery Stories 2000 and has been nominated twice for a Pushcart Prize. 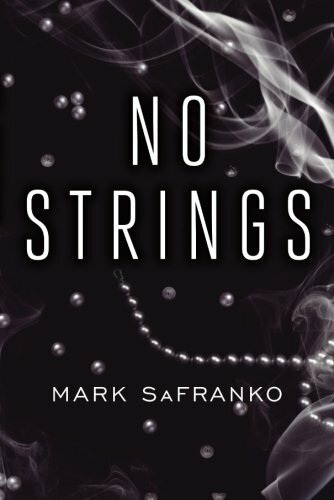 No Strings is an in your face story about a man who dares go after what he wants and dispenses with any threat to that quest. The fast moving fiction noir reads like pulp fiction as it tells the story of protagonist, Richard Martzen, who searches for a woman with whom to have a perfect affair. Richard’s marriage to wife Monica is comfortable yet unexciting. She’s older than he is, but she’s also rich, and therefore Richard lacks for nothing. They live in a big house, drive expensive cars, and travel extensively It’s a relationship that has served him well financially, but left him lusting for a sexual adventure that will satisfy his growing needs. Richard devises an elaborate scheme that he hopes will cause his wife to accuse him of cheating, even though he has yet to begin an affair. He begins to stay out late and offers only weak excuses for his absence. This behavior causes Monica to have him followed by a private investigator. The PI tails Richard and eventually advises his client that he finds no evidence of Richard being unfaithful. Now that his wife is satisfied her husband is not a cheater, Richard can move forward with his plan. Thus begins Richard’s search for a woman who seeks the same thing he does—an affair with no strings attached. He communicates with potential partners through a PO Box and settles on a woman named Gretchen. She tells Richard she is married to a man of means who is much older, thus her desire for a fling outside the marital bedroom. Months pass and the cheaters meet in various hotels throughout the city for their adulterous activity. The action never ends. There is no shortage of surprises in store for the reader in this hardboiled story. No Strings gets under your skin like a rash that won’t go away. You keep scratching until it no longer bothers you. You won’t want to put it down until you learn what finally happens to Richard and his perfect affair.